All about what I like to eat, pray about and love to do. This flash fiction is inspired by the following photo prompt. the challenge is hosted by Madison Woods. Head over there for more flash fiction action. I welcome constructive criticisms. That’s why I am posting these pieces on a blog. 🙂 Thanks in advance for taking the time to comment. Let’s take a dip to cool off before food. Please don’t! You promised today would be just for us. I apologised to her but answered the call. My secretary said that I was urgently needed back in the office. I’ll walk back after lunch. Alone. Again. I sit down on the grassy bank. I feel the morning dew seeping through my jeans. I watch the sun rise. Its orangey rays illuminate the mist covered fields. But they are not strong enough to chase away the chill within me. Last night she told me she wants a divorce. This week’s Flash Fiction Faction by Quill Shiv is a picture prompt. Head over there to read more Flash Fiction Factions. As usual, I appreciate your comments, feedback and constructive criticisms. Samantha raised her hand but Mrs. Sweet ignored her. 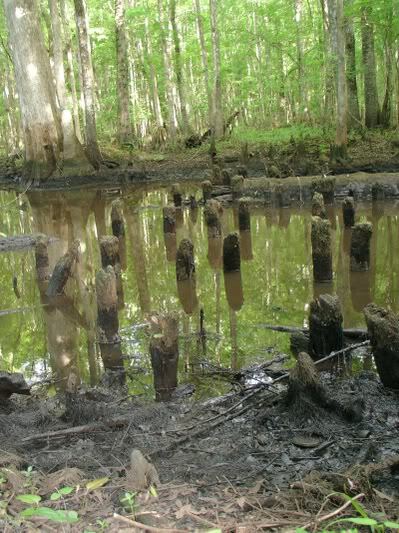 “We will not carry on until someone tells me how a marsh is formed.” Samantha yearned to take off her rubber boots and wade into the murky waters. She imagined the mud oozing through her ticklish toes. However her classmates thought learning was for losers, which resulted in a silent standoff between Mrs. Sweet and the class. “Me! Me,” cried Samantha impatiently. “Give the others a chance…aw!” While talking to Samantha, Mrs. Sweet took a step backwards and tripped over a rotting bridge piling. With a muddy splash, she landed on her bottom. The class broke their silence with unbridled laughter. I made use of one of the plot ideas, I posted today for another challenge. Hope you enjoy reading it. As usual I am open to constructive criticisms. Edit: Based on the feedback I have received from two readers, I have edited the tenses used in the original version. Pat throws a single red rose onto the shiny coffin, lying in its earthy grave. She wills her eyes to stay dry. A hand strokes her back; as gently as Jack had done 50 years ago. That time she had been crying; mourning the death of her pet rabbit. A funeral was held in her parents’ garden. Jack, the neighbour’s son, had attended the ceremony. He had stroked her back – seeking to soothe her pain and hoping that she would stop sobbing. He could never bear to see her in tears. As a child, she had used it to her benefit many a time. Her reward had always been something sweet to eat. It took another 3 years and a few broken hearts before their relationship crossed the platonic line. Pat has a clear memory of the day it happened. She was at a classmate’s 18th birthday party. Unfortunately her ex-boyfriend was present too because his new girlfriend was the birthday girl’s best friend. She would have stayed at home had she known that earlier. But she wouldn’t give her ex the satisfaction of seeing her scamper from his presence. Biting the straw in her glass of unidentifiable sickly sweet concoction, she mentally went through different ways to get her revenge. Pat contemplated lying for a second. But Jack would know, if she was telling the truth or not. There were times, she was certain he had the ability to read her mind. When it came to Jack, she was an open book. Pat told him her story. She had been going out with Michael for 6 months, when she found out that he was cheating on her. He had laughed, when she had confronted him with it. He had accused her of being conservative. According to him, she should loosen up because open relationships are common. They both looked over to Michael after she finished her tale. Suddenly Pat felt shy, as she was reminded of the numerous teenage fantasies she had involving Jack. 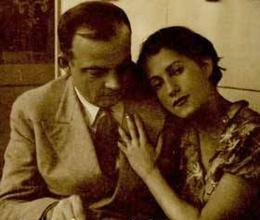 It was during a phase when she had been terribly infatuated with Jack. Her crush had faded after he moved away to attend university. But she felt it return full force as she looked into his honey brown eyes. All at once blood was rushing to her head, her heart was pounding in her ears, and butterflies were wrecking havoc in her stomach. She quickly lowered her eyes but not before Jack noticed what was going through her mind. Michael was nowhere in her thoughts as she leaned in towards Jack. Pat wanted to squeeze in all her past fantasies into that one moment, lest there wouldn’t be a second time. Their faces were almost touching – she could smell the minty scent of his chewing gum. She closed her eyes and let instinct take over. Pat opens her eyes. The happy bubble burst, exposing her to her ultimate fear. She is single again after 45 years of marriage! Her egoistic wish has been to be the first to die because she couldn’t bear the thought of a life without Jack. But the cancer has destroyed her hope. She is afraid of being alone. Her children have their own families and soon they would go back to their own lives. What can an old woman like her do with the rest of her life? A single tear threatens to roll down her cheek. Pat sniffs into her handkerchief and dabbs at her eye. She prays Jack is happy wherever he was. There would be enough time to be afraid of the future after the ceremony. Irene squeezed her eyes shut blocking out the sunrays and pulled the blanket over her head. M opened the windows letting in the sound of birds chirping and thousands of invisible pollen. Although she could not see them, she felt their presence immediately. She rubbed her tongue against the roof of her mouth. With closed eyes she groped for the packet of Kleenex she always kept on the nightstand. The itch spread to her nostril and she felt the pressure to sneeze growing within her. She was ready to give in to it. Without another word, Irene ate her toast with jam and drank her semi-hot cup of chocolate quickly. M was probably trying to make her agreeable by serving breakfast in bed. She dragged herself from the bed and into the bathroom. The hot shower caused the sore skin around her upper lips to burn; another reason why she hated spring. The following weeks she would be wearing a moustache of crusted skin, caused by the attrition of super soft paper handkerchiefs against her even softer facial skin. Irene washed down her allergy tablet with a big gulp of water. She packed her anti-allergic eye drops and nasal spray in her handbag. She was ready for the wild outdoors! Irene stopped in midstride and pressed her upper thighs together. Another watery glob of pollens came charging out of her nostrils. But she was ready to capture it with a new paper handkerchief. She folded the tissue in half and held it before her nose like a hygiene mask, ready for the next sneeze. The tingly feeling in her nose was a dead giveaway that she wouldn’t have to wait long for the next one. She scanned the crowd around her. Where was he? She had only paused for a few seconds. He couldn’t have gone far. That is the problem with visiting an outdoor mobile home fair. On the one hand, the constant pollen attack was weakening her physical state of being. On the other hand, she kept losing track of M in the blink of an eye it took her to sneeze. She remained standing in the middle of the path. He had to come out of one of these mobile homes sooner or later. She felt drained of all energy. Too bad she was too old to lug a schnuffeltuch around. She would love to curl up on her sofa with a comforter and give in to the feeling of sickness that overwhelmed her. But she couldn’t hide indoors all spring or could she? She contemplated the repercussions of such a decision when someone tapped her on the shoulder. They walked down the aisle hand in hand. 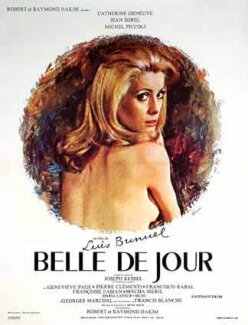 Belle de Jour – A strong female or a dispaired soul? In 1998, as part of my Film Critic course in university, I watched the movie Belle de Jour. The French movie was directed by Luis Buñuel in 1967. Given the almost 20 years gap between the time the movie was filmed and the time I watched it, I did not expect the movie to shock me as it did.